Controlling aquatic insect pests begins with accurate identification. These pests can all present problems for the enjoyment of your lake, waterfront, patio or home. Black flies (sometimes called a buffalo gnat, turkey gnat, or white socks) are common in humid, wooded regions in summer months and can be found throughout semitropical regions year round. Black flies are most active around sunset during June and July and act as severe nuisances to backpackers, hikers and other outdoor enthusiasts. Black flies are not active at night, nor do they live indoors. Black fly larvae thrive in all kinds of flowing water, making them most common in creeks and waterfalls. Adults seek moist environments and may bite exposed skin such as the face. They may also find their way under belts and socks, although they are incapable of piercing through clothing. In order to avoid being bothered by black flies, hikers often tightly tuck in their shirts and pants. These insects have proven to be such a nuisance in summer months that special hiking gear has been developed to combat them. Research also shows that black flies are more attracted to dark colors than to light colors; hikers who dress accordingly are less likely to be bothered. Deer fly adults range in size from about ¼ to 1/3 inches long. Their wings are clear, but with dark bands or patches and their bodies are gray or light brown and some species have yellow and black striping. Some of the more distinctive deer fly characteristics are their large, often brightly colored eyes and their antennae are usually longer than their head. 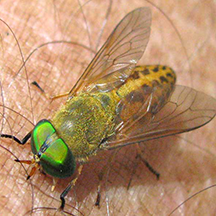 The female deer fly bite involves two pairs of mouthpart “blades” that the fly uses to cut the skin. Once the skin is injured, blood begins to flow and the female then uses other mouthpart components to lap up and ingest the exposed blood. Deer flies will feed on a variety of mammals that include humans, pets, livestock and deer. Horse flies varying in length from about ½ to 1 ¼ inches long, are black or gray in color and often have large, brilliant green eyes. The blood feeding female horse fly is equipped with blade-like mouthparts, which slash tissues and blood vessels and cause blood to flow to wounds. Females then use their sponge-like mouthparts for sucking up blood. Males only feed on pollen and nectar and have similar, but much weaker mouthparts. All horse flies have antennae that are shorter than the head. Horse flies are similar to deer flies, and both are in the family Tabanidae. The two ways to tell them apart is to look at their overall size and their wings. 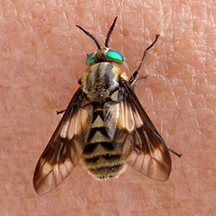 Horse flies tend to be much larger with a stouter body and a very large head with very large eyes. Their wings are usually clear or cloudy whereas deer flies have dark bands or spots across their wings. 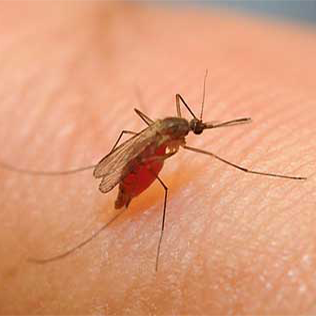 Adult mosquitoes prefer to be most active from dusk until dawn but can become active with sufficient cloud cover or in dark shady areas. They do not prefer to be active in the sunshine since they may desiccate and die. 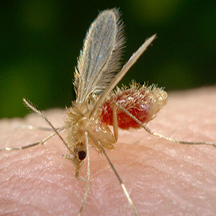 In general, sand fly bites are very painful. Most flies that bite humans feed during the evening and throughout the night. 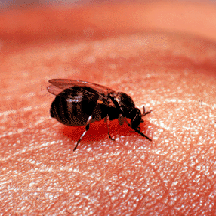 In some cases, flies will attack in the daytime, if they are disturbed while resting. Daytime resting sites include cavities close to the ground such as dry tree holes, hollow logs, palm tree crowns and the canopy of tropical and sub-tropical rain forest jungles. Another commonly found place for daytime resting is inside the home.